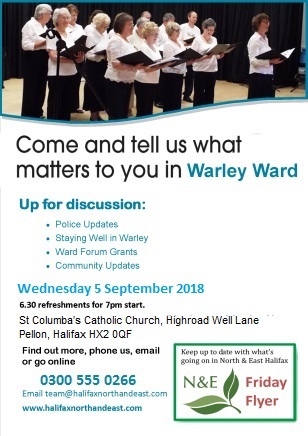 Just a reminder of Warley Ward Forum on Wednesday 5 September 2018, 6:30pm at St Columba’s Catholic Church, Highroad Well Lane, Pellon, Halifax HX2 0QF. The ward forum will be preceded by a Together Housing surgery. 6:15pm refreshments and signing in. 7:00pm meeting starts.